Creepy, dissonant, and disorienting, Birth Canal by Marguerite Humeau takes you through a triple sensory experience that expounds on the mysticism and folklore of childbirth, fertility, and human existence. Upon entering the installation located at the New Museum, an overly-saccharine floral scent saturates your senses— it’s abrasive and too strong to be pleasant. Simultaneously, in the background you can hear an eerie cacophony of wailing, giggling, and humming that sounds neither human nor animal. Accompanied by these sensory accoutrements is the main visual attraction— grotesque venus statues cast in bronze or carved in stone. Drawing from myths of humans consuming animal brains for its psychoactive properties, the sculptures in this installation are an amalgam of various animal brains and venus figures, representing shamanic women of different ages. Divine and bordering on supernatural, this installation feels like a vocal séance attempting to contact something unnatural. Commenting on the eventual extinction of humankind, Humeau posits that humans are born dead when compared to the infinite timeline of the cosmos. Taking an esoteric approach to fertility and childbirth, she abandons the commonly celebrated act of childbirth shifting the focus away from the fetus, and instead emphasizing the act of passing through the birth canal— the birth canal acting as an entrance for both life and death. The eerie chant we hear in the background resemble the muffled confused voices heard in the womb; the smell is reminiscent of the bodily fluids released as we enter the world; and the venus statues depict women as supreme, fertile vessels. We are forced to be familiarized with this deviant narrative of childbirth as we enter this dark spectacle. Additionally, the question of material is brought up— turning to natural elements such as stone and bronze reverts us back to a prehistoric time when these materials were most plentiful. We are transported to a primitive era when fertility was dictated by rituals and symbolic figurines. 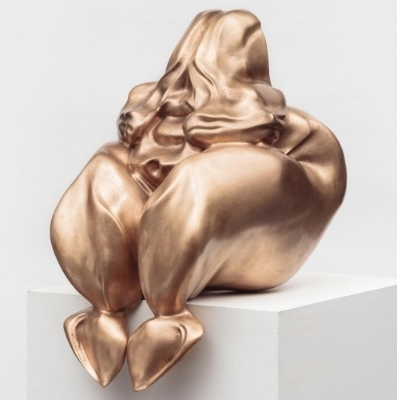 These heavy-breasted, wide-hipped, and genitalial statues exaggerate the absurdity of venus figurines, critiquing the notion that such a form cannot exist in reality. By attaching labial appendages and magnifying skin folds, she perverses the historical concept of the ideal feminine form. Statues posed in a sitting position and bodies misconfigured into unidentifiable parts, we are visually assaulted by Humeau’s venus figurines. Her anthropological approach, albeit disturbing, is an inquiry into the mysticism and curiosities of fertility and human existence.